The juiciness and aroma of home-grown strawberries is beyond compare, and it’s easy to make more plants so you can enjoy an even bigger harvest next year. If you’ve grown strawberries before you’ll have noticed that plants throw out several long, leafless stalks called runners. We can use these to quickly raise new plants. 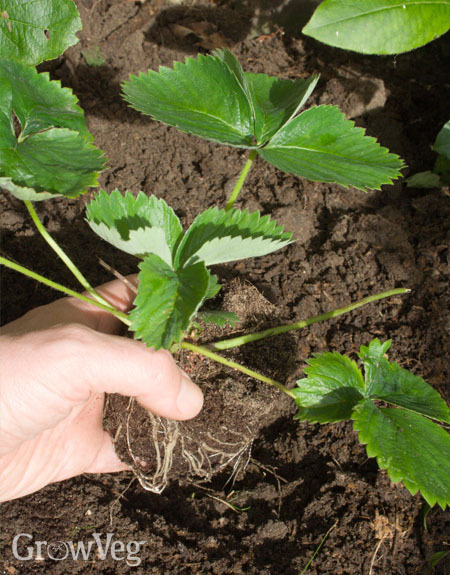 Established strawberry plants will send out multiple runners over the soil surface. Each runner has a tiny plant at its end and these can be rooted and grown on to produce new plants. Runners take a lot of the plant’s energy to produce, so in the first two years of life they should be cut off from where they emerge to concentrate the plant’s efforts on fruit production. From year three some of the runners can be used to propagate new plants. Only ever use healthy runners from vigorous, disease-free plants. Unless you plan to dispose of the parent plants, limit the number of runners to five per plant. Look closely at the plantlet at the end of the runner and you may be able to see tiny roots already beginning to form. To get these to root, simply peg down the plantlet into the ground or into pots of potting soil with a hairpin, U-shaped clip or a length of garden wire bent into shape. Make sure the plantlet is in firm contact with the soil. After about a month to six weeks the plantlet will have started to grow new leaves. At this point, cut it free from the parent plant. Grow the young plant on where it is, or dig it up and replant into fresh ground. 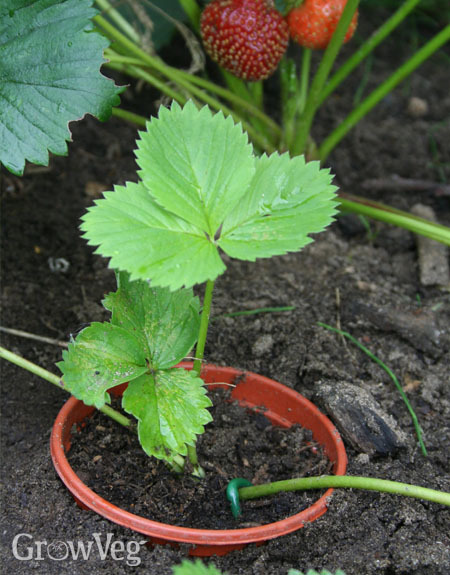 New strawberries rooted into pots can be overwintered in a greenhouse or cold frame then planted out in spring - particularly useful if winters are harsh in your area. Strawberries become less productive over time, so you need to grow more plants from runners every three to four years to ensure continuing good harvests. For best results, grow each new generation of strawberries in a completely fresh bed enriched with compost to avoid the build up of disease. You could also use your new plants to fill a special strawberry planter, troughs, or perhaps a handsome terracotta pot. If you love getting something for free then propagating new strawberry plants from runners is well worthwhile. "Does not say whether you have to water new strawberry plants in greenhouse over winter." "Hi Raymonde. Yes, water new plants in the greenhouse - but only very lightly, just to the compost/potting soil doesn't dry out completely. Then as soon as things begin to warm up even slightly the plants will set into fresh growth and you can pick up the amount of water you're giving them." "can I use the runners that are growing of runners that are in pots from the parent plant if that makes sense"
"Hi Kate. Yes, you can use any runners, so long as they are vigorous and healthy. So runners coming off root runners are absolutely fine." "CAN I REPLANT RUNNERS AND MOTHER PLANT TOGETHER ,THEY ARE ONLY IN A SMALL POT ,AND GROWING WELL,CAN THEY BE PLANTED NOW OUTSIDE, IN SPOT THAT NEVER GETS FROST "
" Yes, you can certainly plant your strawberries out now, especially if frosts are rare where you are. You can plant them all out together, but I would be inclined to detach the young plants from the mother plant and then plant them separately. If the mother plant is old, it is best discarded, as it will begin to deteriorate in quality. But yes, you could plant them all together. " "thanks Ben forgot to say mother plant is a youngun as well, runners are coming from this i only started with 3 plants and have 10 runners ,so can i plant them from her into their own pots regards 1st timer Will"
"Yes, absolutely - that would be fine. If the mother plant is also young, then just consider it another plant. All plants, including the runners, can be potted on into their own pots as long as they have enough roots. You will know this for the runners because when you give them a gentle tug they will stay anchored to the soil. Good luck with your strawberries - and enjoy them!" "cheers Ben, from Liverpool U.K"
"Hi Raymonde I am from India and currently living in New Mumbai which is a populated town. I am the beginners in Strawberry. First i have to start strawberry planting from the pot itself. Could u guide me pls.."
"Hi Abhishek. If you look in the 'More for you' column to the right of this article you should see a recommended article on 'How to choose and grow the best tasting strawberries', which is a great starting point if you are new to growing strawberries. Or use the search tool to find this article." "WHEN IS IT TOO LATE TO ATTEMPT ROOTING THE RUNNERS? NOW OCTOBER IN EASTERN WASHINGTON STATE, AND FROST IS COMING SOON. SHOULD I CUT THEM FREE FROM THE MAIN PLANT AND PLANT EACH "AIR PLANT" IN ITS OWN CONTAINER INSIDE AND WAIT FOR ROOTS?" "You could attempt to root the runners at any time, if the runners are being grown on where the plant is. It may take longer to root - even until spring if the cold weather closes in quickly - but if you anchor the runner down at this stage it will root eventually. Keep the runners attached to the mother plant for now. Only cut the young plantlet free once it's definitely rooted and is therefore drawing it's own moisture and nutrients from the ground." "OOPPS..THANKS FOR ANSWER. I DID NOT SEE IT SO I VENTURED OUT ON A LIMB WITH A RADICAL IDEA. I CUT ALL THE RUNNER PLANTS INTO INDIVIDUAL SECTIONS AND STUCK THEM ALL IN A BUCKET OF WATER AND PLACED INSIDE WHERE IT IS WARMER. I CHECKED TODAY BY PULLING ONE PLANT OUT OF THE WATER, AND IT LOOKS LIKE I CAN SEE TWO ROOTS STARTING TO GROW ABOUT 1/2 INCH LONG. I WILL WAIT A FEW MORE DAYS AND CHECK AGAIN. THE IDEA IS TO PLANT IN SOIL ONCE I GET SOME ROOTS (HOPEFULLY). THEN I WILL KEEP IN THE BASEMENT UNDER LIGHTS UNTIL I GET GOOD LOOKING PLANTS. WILL THIS MAKE THEIR SEASON OUT OF WHACK? FOR NEXT SPRING?" "Hi Artful. It sounds like your technique could certainly work. Growing them on under growlights like this may get them out of whack with the season. What may happen is that they'll grow much quicker than usual, and you may even find you get an earlier crop of strawberries next spring. I would be inclined to get the roots growing, them pot them up into fresh potting soil and grow them on in a bright but cooler place, so they have a more natural temperature and light level. But it may be fun growing them on under lights to see how far advanced they might be." "I just ought to tell you which you have written an exceptional and distinctive post that I really enjoyed reading. Im fascinated by how nicely you laid out your material and presented your views. Thank you. bebgcdfffdkbdafd"
"Thanks very much indeed. Glad you enjoyed the article. There are plenty more on this website - hundreds in fact - so enjoy exploring!" "Can you please give a list of varieties you suggest will grow many runners? I have read that many do no cast many runners. Thank you"
"Hi Lee. Most varieties of strawberries - and every one I have ever come across - does produce runners, so you should be able to propagate from most varieties." "Being a first time Strawberry grower I aked Mr. Google and upi came choices but your makes sense to the first time grower. My two Mother plants have thrown out many children and I will find a home for all based on your teachings. I Johannesburg South Africa we have the best weather so that is not a problem. Our Woolworth, markets 1st grade Strawberries But growing and picking them whenever is more enlightening at 82 years young. " "That's brilliant - glad you've got something to propagate from. Enjoy the juicy bounty that's sure to follow. And keep up with the growing - it's what's keeping you young!" "Hello Thanks for the information. I have strawberries that are growing in hanging baskets. Any ideas on how I can pot the runners? Could I loop them back to the baskets? Cheers"
"Hi Megan. You could give that a go, but I doubt there would be enough room in the basket for uncongested growth. What I would do is take the hanging basket down and rest it on the rim of an empty pot, to steady it. Then fill 7cm/3in pots with fresh compost and pin the runners down into these to produce your new plants. Once they have rooted you can cut the new plants free and always hang up the basket again." "Do wild strawberries have runners ?" "Yes, will strawberries have runners." "I pot runners as it makes it better than disturbing them too often. I bought 5 plants and put them in a deep raised bed, now it is covered in them and I gave away 15 potted runners to a friend and this year so far I have 21 pots with runners. I am making a strawberry barrel using a 50ltr blue plastic barrel and possibly putting it on wheels so it can be moved to the best spot and into the greenhouse during winter. I am also planning to experiment with a horizontal pipe in the greenhouse with a length of guttering below it filled with soil so the runners have somewhere to go as they grow." "It sounds like you're definitely making the most of your strawberries' runners - such an efficient and prolific way to propagate them. I hope your strawberry barrel has come together nicely for you. What a great idea to put it on wheels to 'chase' the light and warmth!" "Dear Artful, Did your strategy work to get early fruiting?" "Hello I live in Weiser Id. and it is late Aug. I see runners hanging off my 4 ft. high planter . second yr. berries were nice. I almost cut runners off, until I read your advice. I think I understand. Leave the runners attached to the mom plant and try to start them in the same area , watered and pinned down until rooted. then they can be de tached and potted ? Thank you so much." "Hi Sandy. Yes, that's right. Let the runners root while they're still attached to the mother plant, as this will improve the chances of them rooting strongly and successfully. Once they are clearly growing away independently, cut them free." "I have runners coming off of runners all in a line if I cut the first runner which is well established will it run a risk of cutting off the nutrient supply to those after it"
"If the runner closest to the mother plant is well established and rooted, then cutting it free shouldn't impact the other runners further down the line, particularly if the other runners are pinned down and beginning to produce roots as well." "Hello from Sydney Many of my strawberries are deformed and do not complete their development. I'm told this can come about from continually using runners, runners again etc. is this true? If not what could be causing this. Noel"
"It sounds like your strawberry plants may have contracted a virus, which can be passed on through strawberries propagated via runners. I would suggest starting with completely new plants and the planting them in a new patch of ground that hasn't had strawberries in it for at least five years. Hope that helps." "I have rooted runners in my strawberry patch. It is now March. If I pot them up now to plant next autumn is it best to pinch out any flowering shoots to make a stronger plant next autumn to plant on. " "Yes, I would pinch out flowering shoots this summer at least. They can then fruit next year."